Restaurants come and go. The building where Pacific Southern is located at 3832 S. Pine Street Tacoma, WA 98409 has had a restaurant in it as far back as I can remember. Not always open, but I think it started with Barcott’s. It was probably run owned and run by Anton Barcott who opened Harbor Lights in 1959. 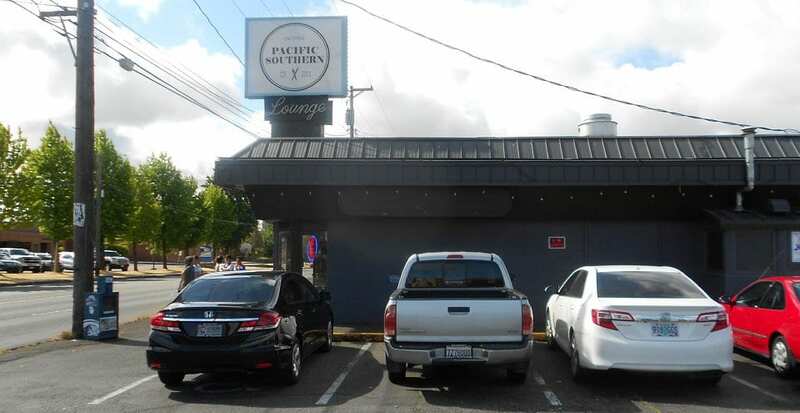 The building where Pacific Southern is located at 3832 S. Pine Street Tacoma, WA 98409 has had a restaurant in it as far back as I can remember. Our little Sunday morning breakfast crew arrived about 9:00 am. There were people waiting to be seated. We were originally told the wait would be about five minutes. After about ten minutes we were told the wait would be about six minutes. We were finally allowed to enter and sit while a table was cleaned and set. I was ready to go somewhere else. We finally sat at our table about 9:16. I was grumpy until the food arrived. Next time, we’ll maker reservations – 253-474-9898 – www.pacsouthtacoma.com. One of our group was a little peeved that pancakes were not available. The menu offered options, however. With the Breakfast Plate – two eggs any style, hash browns, or roasted red potatoes, choice of sausage, bacon, or ham and toast – you can substitute a waffle or the catfish fillet. Gluten Free options were few, but one of them was the Shrimp & Grits – Sautéed shrimp tossed in buttery grits, spinach, red onion and topped with Parmesan cheese. The kitchen messed up the order, but once it was all delivered it was excellent. I had a forkful of grits. 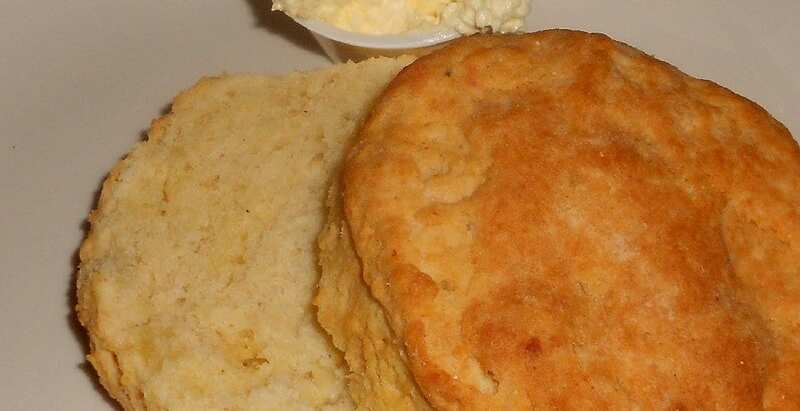 I like grits and enjoyed the bite. I was more than pleased, with my order. The hash browns were dark, reddish brown. My chicken fried steak was crunchy and the gravy was absolutely perfect. I was more than pleased, with my order. The hash browns were dark, reddish brown. 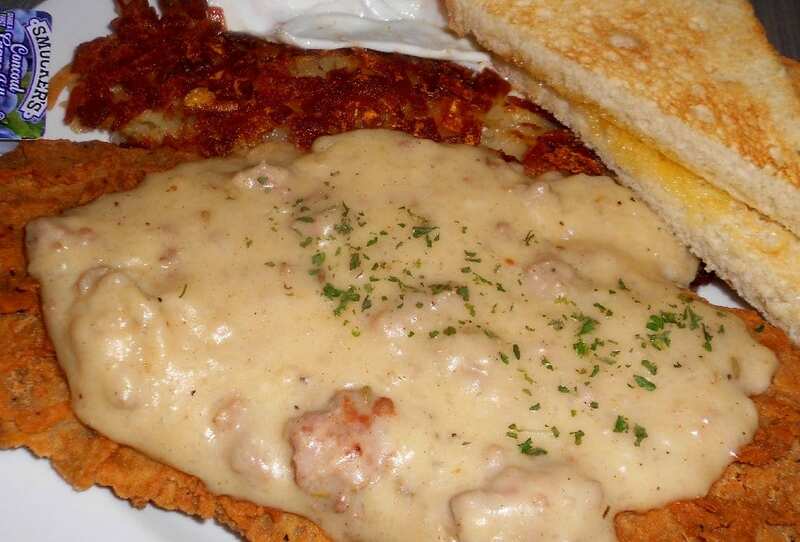 My chicken fried steak was crunchy and the gravy was absolutely perfect. Peg thought it too peppery. The portion size was huge. After sharing a nice size bite with Peg, I still had a five inch plus piece to take home. Peg had the basic breakfast. She substituted the meat for the catfish and she substituted the waffle for the toast. Each substitution costs $3.99. The waffle was a Belgian waffle and well worth the exchange. The catfish on the other hand was the only real disappointment. It was bland and mostly batter. Two friends had the waffle also and enjoyed them. I really enjoyed the biscuit. It was huge, but could have been half as big and I would have enjoyed it as well. I was asleep at the switch when I selected sour dough toast. I should have ordered the biscuit as a substitute. As a sub, it would have been only a dollar extra, as an addition it was $1.99. I think our group will return there for an occasional breakfast, if not, then I will return as a single or with Peg. Next time I know what I will order: Chicken Fried Steak with burnt, burnt, burnt hash browns, a biscuit and extra gravy. I would also add the Southern Sweet Tea. The time after that I might go for the basic Breakfast Plate with a waffle instead of toast, and crispy red potatoes. I really enjoyed the biscuit. It was huge, but could have been half as big and I would have enjoyed it as well. I ate part of the bottom half. The top half had a Peggy bite out of it. With butter and jam it will make a nice dessert accompanying the left-over chicken fried steak.